CARMEL, IN – October 14, 2009 – Michele L. Jackson, who chairs the Adoption Practice Group of Carmel law firm JOCHAM HARDEN DIMICK JACKSON, PC recently returned from the Democratic Republic of Congo (formerly Zaire, commonly referred to as the “DRC”) where she traveled from September 25 – October 2, 2009. Accompanied by members of her adoption agency, MLJ Adoptions, she visited with government authorities as part of her new international adoption program. Michele began development of the new program in January 2009 with the help of a Congolese attorney based in Chicago, who divides her residency between the Midwest and the DRC. During her visit to DRC, Michele and her team visited more than 200 children in 5 orphanages, including a facility which cares for children with HIV. She distributed 6 boxes of donated clothing and school supplies. Sanctified, one of the orphanages, has no electricity, blankets or running water, yet houses 48 children ages 4 months to 14 years. Michele and her team personally donated $1,000 and are seeking to raise $1,500 more to help acquire basic services for the orphanage. During the trip to DRC, the team learned there are more than 4.5 million orphans in DRC alone, with approximately 400,000 of them available for adoption. Time from submission of an application to completion of the adoption is 4-12 months, which is shorter than average for many inter-country adoptions. 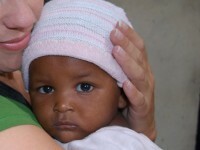 MLJ Adoptions will immediately begin taking applications for parents who want to adopt from DRC. JHDJ Law’s Adoption Practice Group offers legal services for domestic and international adoption, including private and agency adoptions, step-parent adoptions, second parent adoptions, and surrogacy contracts. Michele represents both birth and adoptive parents, and provides resources and adoption education. She also offers other various international family law services, including adoption contract reviews, international custody, abduction prevention, and orphan visa appeals.